“Synchronicity” is having a field day with me these days – it seems as if everything I come across relates to something else I’m working on. 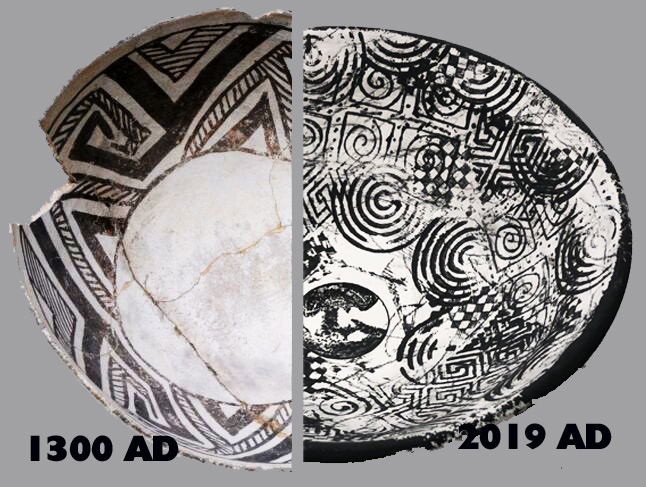 Case in point: I’ve been researching pottery shards (or “sherds,” as they are often called in archeological reports) found near a burial site near Olmos Basin and have discovered that some really beautiful versions of black-on-white designs existed in this area and farther west and north. 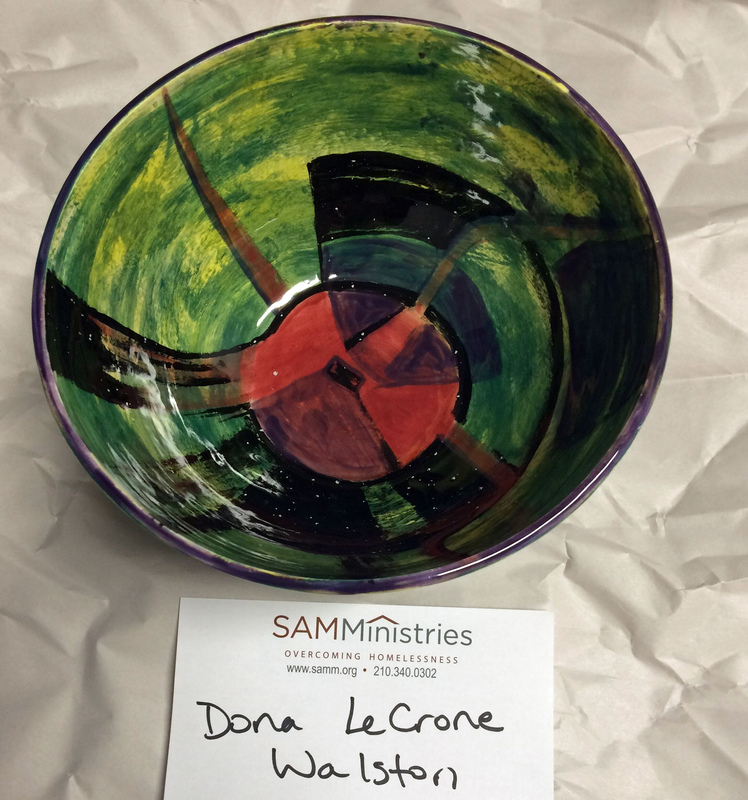 About this same time, it so happened that I was supposed to design a bowl for the Empty Bowls fundraiser that’s held every year for SAMMinistries (which helps the homeless). When I saw those ancient black-and-white pot shards, I was totally inspired. 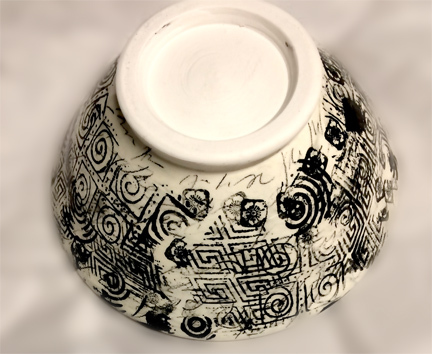 I wanted make a bowl to pay homage to that work, but time was of the essence and I couldn’t spend many hours hand-painting the intricate designs.Then I remembered that I had purchased a Potter’s Stamp from Road Runner Clay last year. 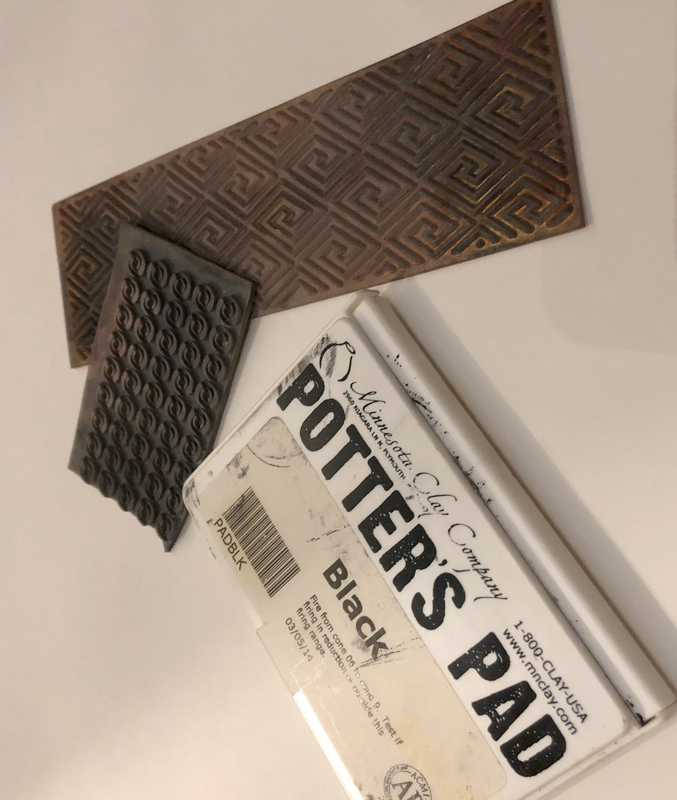 I got out my flexible clay texture stamps and the Potter’s Pad. 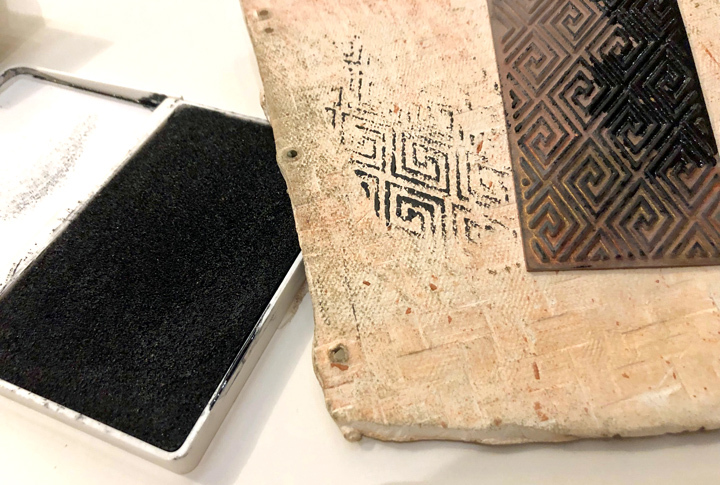 This works just like a regular stamp pad, but it contains an underglaze for clay surfaces. You can use any craft stamp to apply the underglaze to bisqueware (clay that has been fired once, but not glazed). Once the piece has been stamped, clear glaze is put over the surface as a top coat, and the pot is fired again. 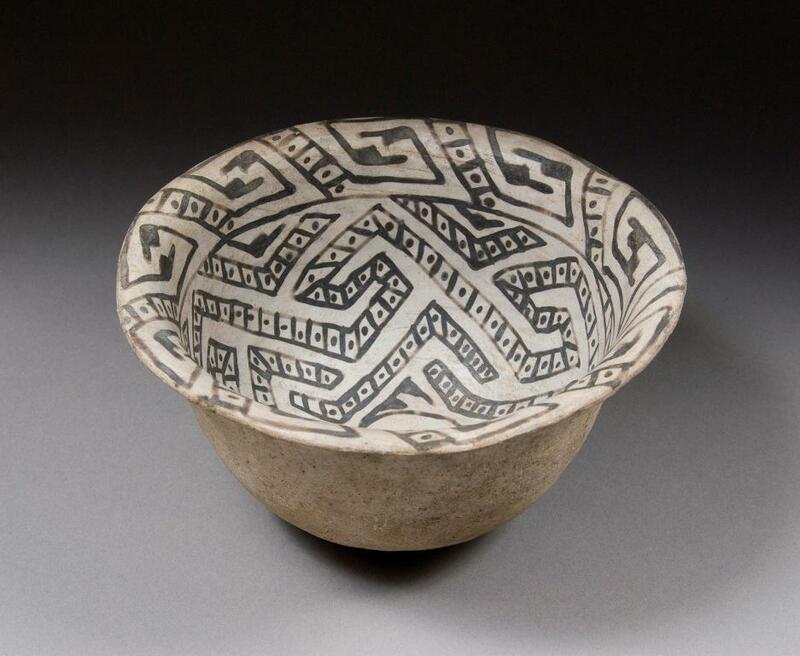 Here is my stamped bowl – not quite Anasazi, but it does have that look, with a contemporary twist. I also used an underglaze pencil to do some asemic writing on the first layer. Here’s what the underside of the bowl looks like. 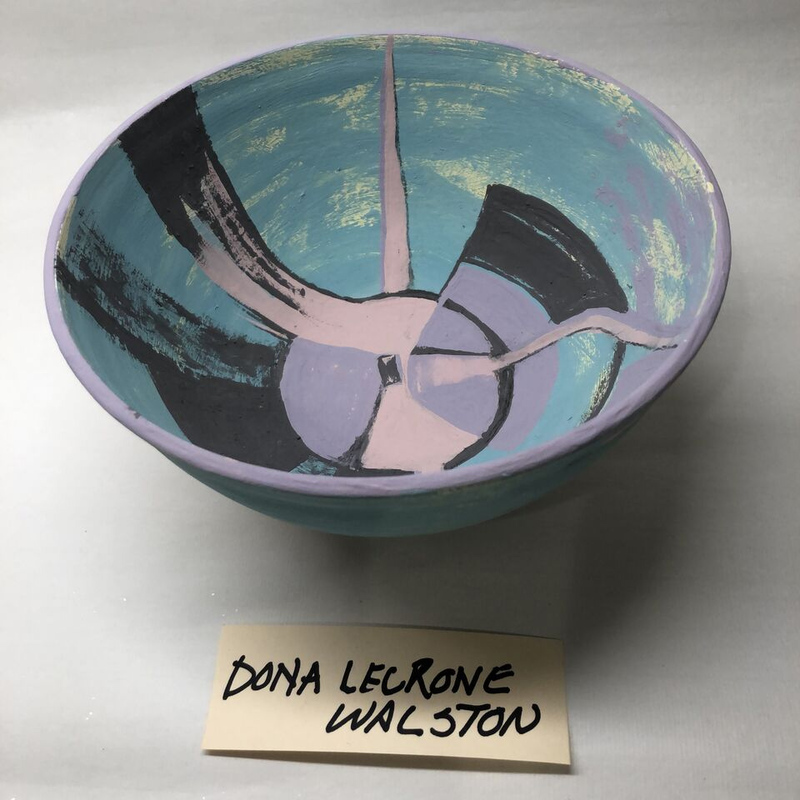 Several other artists in the San Antonio Art League also painted underglaze designs for the Empty Bowls fundraiser. They were gorgeous! These artists were braver than I was, and used colored underglaze, which really change when fired. Here are photos of Dona Walston’s bowl before and after firing. Underglazes, whether painted or stamped, are a wonderful way for a painter to experiment with pottery! I encourage everyone to come to the Empty Bowls Event on March 3rd at the SW School of Art. 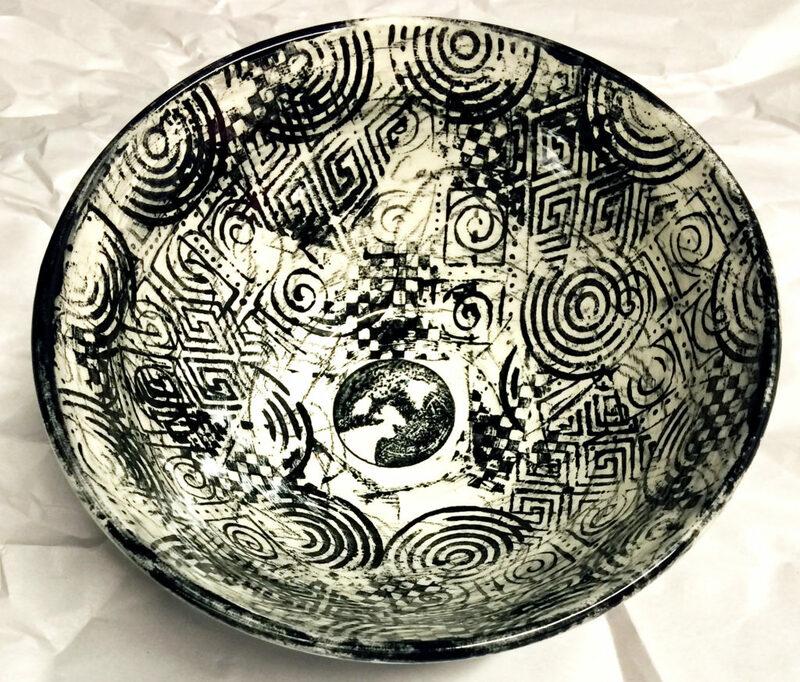 And for a sneak preview, click on the video below with more bowl photos from SAALM artists. SAALM & SAPG partner for EMPTY BOWLS 2019 from Lyn Belisle on Vimeo.